When you’re taking a drive out somewhere on some winding road, the sound you choose to accompany you becomes inspiration. Like the moon from a passing train, the sounds are your night light, your escape from the endless distance and dusty winds. When these distances cover the infinite backgrounds of Indiana, Montana and the plains of somewhere – very few provide true inspiration. Reserved for those who’ve mastered the methods of soulful heartland rock n’ roll, this musical form of art transcends boundaries of genres and musical styles. Recognized by it’s emergence in 1996 (after being known as Split Lip for five years), Chamberlain was such a musical entity. Running through a range of beautiful compositions, styles and musical diversity, Chamberlain managed to capture the imagery of the lonely imagination. With the 1996 release of their much praised LP, “Fate’s Got a Driver”, they not only captured the hearts and minds of audiences worldwide, but provided incredible groundwork for a truly defining music career. What followed were two more incredible full length releases, a 7″ single and most recently – an incredible 28 track, double disc compilation of some of their finest work. While they may have made their exit, “Five Year Diary” proves that their music will be remembered and cherished long after they took the stage for the last time. Chamberlain may no longer exist, but their work will forever evoke the passions of imagination – the sounds of America. David Moore was the vocalist and primary lyricist of Chamberlain. He composed and wrote heartfelt and honest lyrics while lending his hand on some acoustic work for the band. He took some time and answered a few questions during the month of October, 2002. First of all, let us know what this latest release “Five Year Diary / 1996-2000” holds and what listeners can expect from this double disc set? Five-Year Diary is a 28-track compilation of live performances, early studio demos, some of which have not been previously released, and a few songs from Big Brown, the little cabin in the woods of Southern Indiana where I wrote the lyrics of many of the Chamberlain songs and where the band practiced for years. This retrospective album covers the full range of the music created during the Chamberlain years. Is this the final Chamberlain release or is there the chance for more new material in the future? With the release of Five-Year Diary, I think all of our recorded material has now been published. We wrote a couple of songs that were never recorded – New Day and With You Always. A live performance of New Day was captured on the RIDE video, and there’s just a bit of With You Always in a sound check segment of the video. For those who are unfamiliar, share with us a little Chamberlain history. Chamberlain emerged in 1996 from its origin as a punk band called Split Lip. We released Fate’s Got a Driver under the Chamberlain name that year. 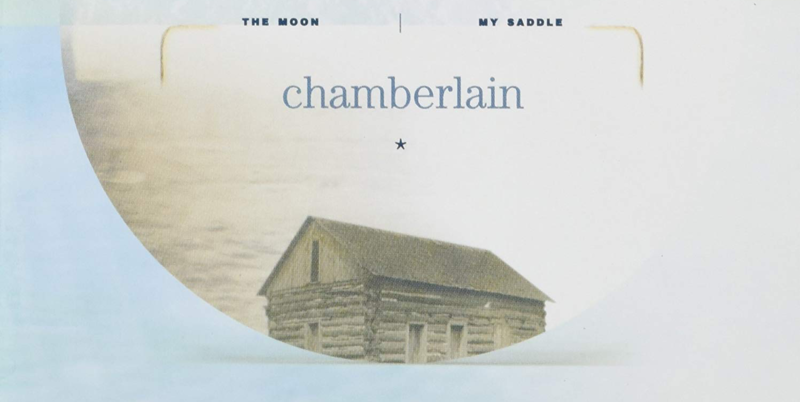 And, although the five members of the band remained the same through 1998, new musical directions emerged with the name change as evidenced by our second and third albums, The Moon My Saddle and Exit 263. Counting the Split Lip era, the group was around for about 11 years. We were all kids when we started – only one of us was old enough to drive! Your record, “Fate’s Got a Driver” is not only one of the most moving records to have been released in the past decade but to this day continues to amaze people. What do you think stands out the most, in your opinion, about this album? Thank you so much for that kind comment. First and foremost, the compositions are the standout feature of this album. The songs are melodic and memorable. I think the lyrics touched people as well. And all the songs taken together have an impact that has continued to make its mark on listeners. Six years later, Fate’s is still attracting new fans to our music. There is substantial growth and maturity between “Fate’s Got a Driver” and “The Moon My Saddle”. What do you feel is the biggest difference between the records? At the time, did you approach the song writing process for each record differently? I’ve always believed that one of the things that drew people to Fate’s Got a Driver was its maturity – both in terms of the musical structure and arrangements, the prowess of the instrumental performances and the depth that the lyrics seemed to reach. The musical compositions on The Moon My Saddle are, perhaps, more mature in their lyrical content, but that just seems to be the natural consequence of growing up a bit and being exposed to different experiences. The writing process was similar for both albums…although several of the songs on Moon were written on a long-distance basis because I was in Montana and Adam was in Indiana at the time we were writing those songs. He’d send me tapes of the music that he was composing, and I’d write the lyrics. No doubt, being in Montana influenced the lyrical composition of some of the songs on Moon. “The Moon My Saddle” was the last release on Doghouse Records – how did you first end up working together and what were some of the factors behind parting ways with them? We met Dirk Hemsath, the owner of Doghouse, shortly after we formed Split Lip. Dirk was in a band at the time. When he decided to start his own label, he approached us about recording an EP, which turned out to be the Soulkill record. That record really “put us on the map” locally and regionally and started what became to be an 8-year association with Doghouse. Our contract with Doghouse was completed with the recording of The Moon My Saddle, and at that time, we were pushing hard to find a home with a larger independent or major label. When our management decided to release the band’s final recordings on Exit 263, they negotiated with Doghouse, but a couple of obstacles surfaced that couldn’t be resolved and the record was self-released. I’ll always be grateful to Dirk for believing in a group of untested and untried teenagers from the suburbs of Indianapolis. Personally speaking, what were some of the most important things you learned from dealing with a label at a relatively young age? Working with a label requires a certain willingness to bend – to listen to the opinions of others – to learn that sometimes you don’t know everything you think you know. We were young and headstrong, but Doghouse always gave us the space we needed to follow our own vision. The music and lyrics are incredible honest and heartfelt, who inspires you to write, whether they are artists of music/literature or those outside that field? I am inspired most by ordinary people and ordinary experiences – mine and those of the people around me or the people I’ve read about. I read a lot – fiction, non-fiction, essays, and poetry. I’ve also traveled a good bit and that adds some color to the themes I choose to write about. With respect to music, I was influenced from a very young age by the poetic genius of Bob Dylan. What do you feel has been the biggest motivation and inspiration for Chamberlain over the course of your albums, from “Fate’s Got a Driver” to “Exit 263” to the release of the double disc set? And how has it affected you outside the realm of being musicians? Defining a vision and pursuing it. That’s as important in music as it is in life. Are there those out there who you’d like to collaborate with musically? And what are the members of Chamberlain currently listening to? I’m drawn to the music of Greg Brown, Van Morrison, Bob Dylan, Wilson Pickett, Cat Stevens, James Taylor. I can’t really say what the other members of the band might be listening to now. I haven’t spent much time with them recently. I’ve been completing my undergraduate degree at Indiana University. Adam has moved to New York and the other guys are spread out across the country. There are two (if I’m correct) versions of the song “Good Enough”, one on the LP “The Moon My Saddle” and one on the single/7″. Are there other songs you’d like to do again to perhaps do different versions of? It’s hard to get to the place where you’re completely satisfied with a recording. Many of the songs on Exit 263 were songs in development, and I think we would have polished them a bit more if time and circumstances had permitted. However, lots of people have told us that they love the raw sound of those songs. I’m generally very happy with the music we created and grateful to know that it has touched people in a meaningful way. Is there a record that stands out as your favorite? The one where you enjoyed the process of writing, recording and performing the most? I like Strange Days and Hope You Show Up Soon; both are very personal songs about family relationships. I like Until the Day Burns Down, Santa Fe, Last to Know, Five-Year Diary, Sleep, Street Singer. I truly enjoyed the process of writing every song, and I’ve written a few others that I might decide to record some day. What are the best things about touring and what are some of the less than enjoyable aspects? Can we expect Chamberlain to hit the stage anytime soon? The thing I liked best about touring was meeting people and spending time with our fans. The thing I liked least was sleeping on bare floors in strange apartments and flats where, in the early days, fans were willing to put us up for a night. So many people were amazingly generous, but when you’re on the road for weeks, that kind of existence wears you down. Looking ahead, I’d say it’s unlikely that Chamberlain will regroup and tour again. Do you have some tour memories that stand out in particular as the best or the least enjoyable? I remember a place where we bunked one night in Germany during our 1996 European tour. It was a large building of some kind – not someone’s home – more like a community center or school, perhaps. There were all kinds of strange costumes and wigs piled up in a corner. Chuck, our drummer, kept us laughing all night modeling those costumes and putting on quite a show. We got some great photos of him in those outfits, which I know he’d like to burn. Looking back, what would you say has been the most rewarding aspect of being Chamberlain – writing, recording and performing? How would you all like to be looked upon most, whether it is by your fans, family or friends? Being a part of a group for such a long time during the formative years of one’s life is an experience that’s never forgotten. It touches you in so many ways – some of which are not always fathomable. I learned everything I know about music in association with those guys. And, I learned a lot about life’s drama, too. Looking back on the experience, I realize how truly momentous it was. We created a body of work that survives us. I think we all feel a great sense of accomplishment in simply having done it. And, our loyal fans around the world have brought so much meaning to our efforts. So many people still write to share their thoughts and sentiments about the music…to tell us how one song or another has touched their lives. Recently, we received a letter from a couple who were planning their wedding and wrote to tell us that they had decided to use Chivalry as their wedding song. I was touched by that. It made me realize that the music has a life of its own. Hopefully, it will continue to touch people in some meaningful way – even though those who created it are now pursuing other interests. I like to think it will.